Life In Smirleyworld: It's Polly Time! 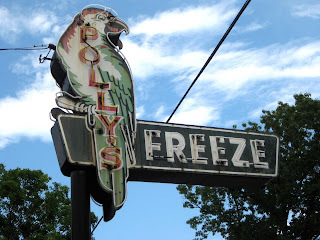 Just up the interstate is a wonderful treasure from the past- Polly's Freeze! Located in Georgetown, IN, the walk up ice cream and sandwich stand has been around since 1952. Tim and I treated ourselves to soft serve cones last Saturday night and enjoyed the nostalgic atmosphere! Looks like fun! Not very many of those original soft~serve places left. Love the sign. We had a "Cupie Cone" joint with similar charm. They tore it down and put in a starbucks...they call the little strip mall Cupie Corner (says so on the building)...not the same charm at all. Enjoy that little cone of American history. Did you take the drive up the old hill? That's the best route, instead of the interstate. Ann, I forgot...we'll have to the next time! I grew up just half a mile from Pollys Freeze and spent many summers sipping a shake and splitting a 'porkette' with my sister.